They thought they were hiding from me. I let them believe it. Now if only everything was that easy. Yes, that's Gracie on the left wearing a t-shirt of mine. She likes to wear clothing that is any person's but her own. Except her black dressy shoes, the ones that click on the floor when she walks. She would rather take a bath with them on then risk her sister, Isabella, sneaking them onto her own feet. 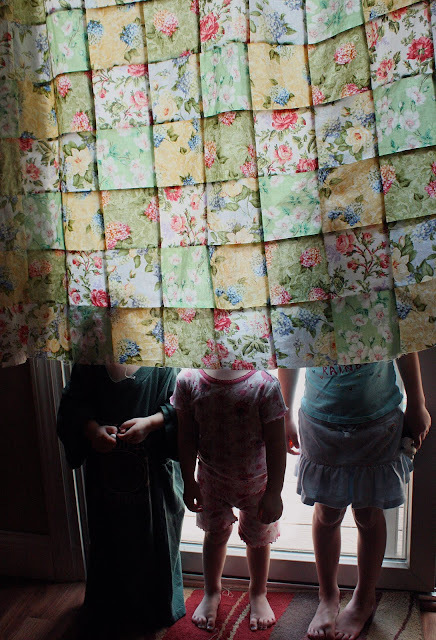 I'm finished sewing the top of my picnic blanket and hung it on the back door curtain rod to shade the sunlight from heating the house and because I liked the way the light lit it up. They came in from playing and hid behind it, giggling. I, of course, rendered them invisible if only for a few moments before they pulled on the fabric and sent it cascading in a heap on top of their heads. I wish I could reverse that trick and let them pretend that I have disappeared. Thanks for your comment on my blog! I can't wait to see how your picnic blanket turns out. Looks great already.